you might have asked why I wrote this recent critical post about an Indian guru (Yogananda), and why I suggested that a modern singer like Maryam Akhondy is a much better interprete of classical Persian poetry by Omar Khayyam. Here is an example of an original Omar Khayyam rubbayat and the silly Yogananda interpretation. Also, at the end of the post, don’t miss Nancy Sinatras song “You Only Live Twice”, and tell me if you see any similarity to Omar Khayyam. The Sultan’s Turret in a Noose of Light. Morning — The dawn of awakening from delusive material existence. Bowl of Night — The dark night of soul-ignorance. Stone — Delusion-shattering acts of spiritual self-discipline. Stars — Falsely attractive material desires. Hunter of the East — Eastern wisdom, hunter and destroyer of delusion. Sultan’s Turret — The kingly minaret of pride. Forsake delusion! Absorb into your innermost Self the calm light of wisdom. Listen! your soul calls you to embrace a new adventure. As the sun travels from east to west across the sky, so does the light of civilization and of knowledge move across the earth. From the east comes Wisdom’s call: Awake! all you who sleep in ignorance. What has pride brought you but melancholia and pain?—dark products of soul-ignorance. Dispel gloom forever: Abide from today onward in the light of inner peace. What a rediculous attempt by this 20th century wanna-be spiritual leader to understand Omar Khayyams wunderful Rhubbayat. 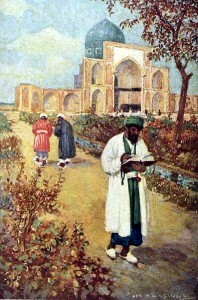 Since Yogananda has not the slightest clue of Omar Khayyams world of thoughts, his deep love for science, pure mathematics, astronomy, and his second love for wine, beauty and the attractions of woman, he can not do anything else than spoiling the clear language of Omar Khayyams rubbayat with “interpretations”. Karl Marx, the great analytic of human society, would have called Yoganandas rediculous “Wine of the Mystic” the clearest example of “Religion as opium for the people”. But Marx died 10 years before Yogananda was born. Omar Khayyam, this outstanding spirit of classical Persian poetry and science, did not only gave us the collections of rubbayats, but invented the binomial coefficients (important for combinatorial calculations), which in the west were attributed to B.Pascal. Here is an interpretation of his rubbayat, that he would have definitely liked much more. It is by Nancy Sinatra, from her great song “YOU ONLY LIVE TWICE”. In this 1967 title song for a 007 – James Bond movie one is indeed reminded of Omar Khayyams rubbayat. Read yourself, and build your own opinion. You don’t need a guru to understand this. One life for yourself and one for your dreams. Till one dream appears and love is its name. Don’t think of the danger or the stranger is gone. This dream is for you, so pay the price. Make one dream come true, you only live twice.